Super Smash Bros. Ultimate set to release in December. And since 'everybody is here,' Shacknews is taking some time to break down each of the game's characters individually, continuing with Sonic. Today, we continue with the most well-recognized character in SEGA'S history. He's the fastest thing alive! Sonic the Hedgehog is Sega's top mascot and has been the face of the company since its console heyday and beyond. He's still beloved to this day, which is partially why some of his 3D outings are so frustrating, but that's an entirely different conversation. Sonic has been saving the world from the threat of Dr. Eggman for over 25 years, using his supersonic speed to run across loops and straight through danger. His speed is only matched by his cool factor, an intangible that nobody else on the Smash Bros. roster possesses. It was never more evident than Sonic's debut in the Smash Bros. series, something I touched on in our retrospective of Super Smash Bros. Brawl's Subspace Emissary story mode. Sonic has starred in many platformers, some of which even star other versions of the classic character. There's Sonic Boom, Sonic Mania, Sonic Generations, and the list goes on. Sonic has dabbled in other genres, like the upcoming Team Sonic Racing, and has even buried the hatchet with Mario and co-starred with the portly plumber for the Mario & Sonic at the Olympic Games series. I'm not sure if anyone knows this, but Sonic is fast. He's very fast. He's the fastest thing alive and has the fastest dashing speed on the Smash Bros. roster. His moves take advantage of his speed, while also borrowing from elements of his games. 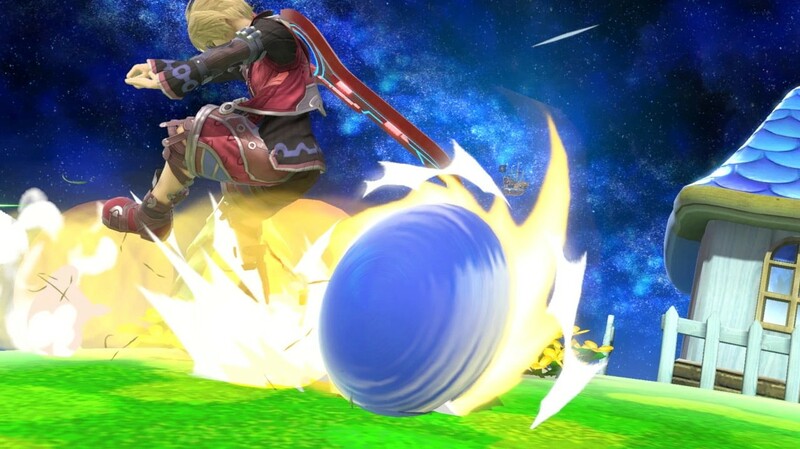 Homing Attack (Neutral B): Lifts Sonic off the ground and homes in on the nearest opponent. Hit B a second time to execute the move early..
Spring Jump (Up B): Pull out a spring from the classic Sonic games and use it to launch the blue hedgehog skyward. The move itself causes no damage, but it's one of the best recovery options in the game. The spring itself can also bop an opponent on its way down for minor damage. Spin Dash (Side B): Sonic's signature move can be charged up before he launches himself at opponents. Has great combo potential, though it apparently can no longer be shield canceled. Spin Charge (Down B): Acts like the Spin Dash, but is more for walloping nearby foes for multiple hits. Keep hitting B to extend the combo. Super Sonic (Final Smash): Sonic uses the Chaos Emeralds to become Super Sonic and fly across the screen, causing massive damage and potentially KO-ing anyone in his way. This move will be faster now than it was in Super Smash Bros. for Wii U/3DS. 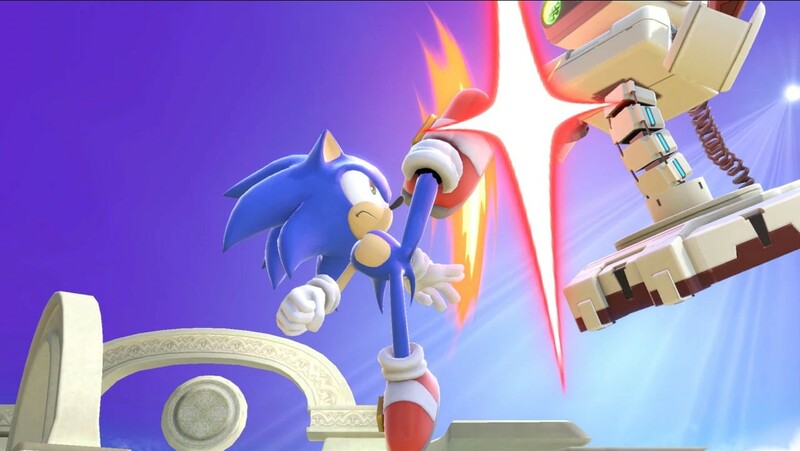 Sonic has several attacks that can reliably connect with opponents, like his dive kick and his Homing Attack, but while they'll do a lot of damage, Sonic isn't exactly a KO master. Sonic's more about outrunning his opponent and isn't for the more aggressive player, though he can be played that way. He also has some incredible recovery options, for those who opt to play the keep-away game. What's changed about Sonic since Super Smash Bros. for Wii U/3DS? Sonic adjusts his arsenal slightly with a dashing kick and a faster Homing Attack. But as noted, Sonic's Spin Dash can no longer be canceled, which takes away one of the hedgehog's big weapons. Super Sonic will also move much faster than before. Looking to play like an expert? I'm not one of those by any stretch of the imagination. Fortunately, Shacknews has scoured the web for breakdowns from the top competitive Smash Bros. players and personalities in the world for some more detailed opinions. In breaking down Mario, we noted that one of the best ways to learn is through direct observation. We broke down Gonzalo "ZeRo" Barrios' Mario play during the E3 Smash Invitational, where he rode the plumber to victory. Did you miss that Grand Finals? Let's rewatch it below. While ZeRo had plenty to say about Mario during the Nintendo Power podcast, he also had a few observations about Sonic, who was on the opposing side during that Grand Finals set. Shacknews quoted ZeRo last time about Sonic's Spin Dash nerf, but that wasn't all that he had to say about the character. "It's hard to react to certain things and Sonic is too fast," ZeRo told the Nintendo Power crew. "Like, I have amazing reaction time. I'm the kind of person who can react to... few frame windows to several things. I can just react on the spot sometimes and Sonic, when he runs past you, you can't tell. It's impossible. If he runs at you, I can't tell if he's going to jump or grab. We have to guess. So that makes Sonic difficult to deal with at a top-level plane, because a good player can mix you up consistently and then it becomes the point where you don't react, so you can't consistently do it, because guessing is guessing. Sometimes you get lucky, sometimes you don't, but you can decrease the luck by reacting. But because Sonic is so fast, you can't react, so that makes him amazing. That's basically why Sonic is really good right now and couple that with the fact that he has a back-throw that kills, he has grab combos that no other character has, his Forward-Smash is absolutely ridiculous, his back-air has this slice of New York City, like it's actually humongous, like back-air stays off forever, always gets the strong hit, and even if he gets the weak hit, it puts him in a spot where you can back-air again, so it's one of the best moves, for sure." While ZeRo has seen the positives in Sonic, a handful of the Sonic mains out in the Smash world are crestfallen with the loss of the Spin Dash shield cancel. Here's top Japanese Sonic player Kengo "KEN" Suzuki reacting to the news. The Sonic faithful are otherwise still looking to get accustomed to some of his minor tweaks, taking the most recent opportunity at CEO 2018 to get their hands on the character. The folks at Most Valuable Gaming and Smash Studios both got a chance to capture a couple of matches. But at least one other person might be converted to the Sonic user base. That's the guy who used Sonic at the Smash Invitational, Leonardo "MkLeo" Lopez. Despite losing, Leo sees the potential in Sonic and is apparently excited to learn the character a little better. Sonic superfan and top Sonic player Kelsy "Supergirlkels" Medeiros later had a chance to try the character out herself. She put out a comprehensive video on what's changed and what players can expect. Super Smash Bros. Ultimate is set to arrive in December on Nintendo Switch. Shacknews will continue looking into each of the game's characters from now through the big day and beyond, so be sure to come back for more breakdowns over the coming weeks. Fans can keep on top of the absolute latest guides and how-tos by checking out Shacknews' Super Smash Bros. Ultimate walkthrough and guide.